So after 2 buses and a boat we arrived in the Belize island of Caye Caulker. It is literally the nicest place i have ever been! It is in the Carribean sea so is surrounded by turqoise water and palm trees. All of the buildings are low rise and painted in bright colours. Most are made of wood and are open fronted to face the sea. On some of the paths you can see the sea on both sides of the island as it is very small. As an island it very much follows the motto of "Don go fast, go slow". In belize there are lots of different kinds of people from all cultures and countries and so while many languages are spoken, the main language is English as it is a former British colony. A lot of the locals are rastas with the dreads in. We have found it quite funny that a lot of people have inside out tshirts because they wear them on both sides before they wash them. All of the loals are really friendly and even though the island relies on tourism the locals do not harass anyone to buy tours or souveniers. Our guide Adriana told me that we were there for the high season but I had expected it to be busier. I think its quite good that the island was not any busier because you can really appreicate the chilled vibe. All of the locals remember you because there are not many tourists so at the bars in the evening they speak to you by name which is nice. Our accomodation is called Tropical Paradise which is at the bottom of the main pathway. We are stayin 2 to a room and the rooms are mainly red and yellow painted bugalows with a double bed each. As the island is so small there are no tarmac roads, the paths are just beaten sand so most people wear flip flops or bare feet. There are 2 main bars on Caye and one is right beside our hotel. Everyone starts there then makes their way down to the Ocean view club. 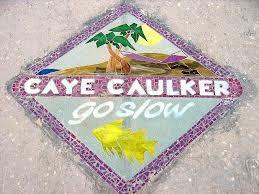 Its basically Caye´s reggae version of The Raz so im cleatly quite the fan lol! As we got to the island as the sun was setting we made our way to a beachfront restaurant and had some food. The dishes are mainly meat or fish with coconut rice and beans and salad and all of the cocktails are rum based. We then made our way to the bar beside the hotel to start off the night and dance to the reggae tunes with our rum punch. We finished the night in a roof top jacuzzi so not bad at all! That night we had booked to go to a BBQ. it was sooo good! lots of seafood and meat and rum punch. The whole group went to the BBQ (activities are optional so the entire group normally doesn´´t do everything). We then went back to the first bar and had an earlish night as we were up the next day for the Full day boat tour. We booked the boat tour through Raggamuffins so met at 10am to get on the boat the "Reggae Prince" with out tour guides Dean and Kevin (who looked like snoop dog". We were out until 5pm and made three 45 min stops to snorkel, The first stop was to get used to the equipment and see some basic fish and coral. The next stop was brillant as the sharks, sting rays and fish come right up to the boat edge and swam right beside us in the water. The next stop took us closer to the protected reef where we seen many types of coral, sting rays, sharks and other fish like green eels and water slugs. As the reef has not been protected for very long it was mainly younger fish but there were so many that it was good. Between the stops there was plenty of time for sunbathing and lunch. The tour cost $140 Belize dollars which is $70US. Obviously you wouldnt want to pay that evryday for activities but it was worth the money and a memorable day. To finish the day we went to the split again and then out to the 2 bars. As is was our last night on the island everyone made the most of it and were quite worse for wear! the tour guides came with us and told us that the 3 men (all looked like fatter verisions of 50 cent and sean kinston) that we had had a funny dance off with the previous night were actually the island police. hahaha. We also had a laugh with the owner of the first bar who was a 5ft old man who had gave us all coconut rum shots the preivous night. So i defintely loved this island it was so beautiful and the people we met were so open and friendly. I hope that increased tourism does not change the Island to much in the way that it has for thailand as the relaxed chilled out way of island life is a main part of the appeal. Niamh gunn Sounds like heaven Eimear! I have snorkelled in some of the best spots in Asia and never seen that range of fish sounds unbelievable!the blog is a great idea!the island sounds unreal, and such a great experience that it hasn't been completely overtaken with tourists. Have a ball..not at all jealous!